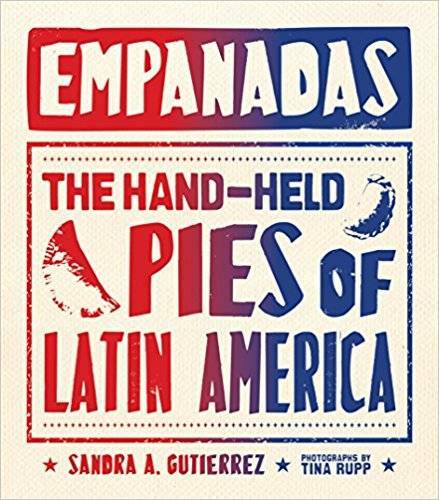 Sandra Gutierrez, "Empanadas: The Hand-Held Pies of Latin America"
Found from New York to Los Angeles, from Mexico to Brazil and into the Latin Caribbean, empanadas are the most widely eaten hand-held pies in the world. They can be filled with a marvelous array of ingredients featuring simple, vibrant flavors and can make a perfect snack, everyday meal, decadent dessert, or great party fare. Empanadas offers a collection of the most delicious recipes and essential tips on creating the perfect mini pie for any occasion, from Argentinian cheesy spinach empanadas, crispy Mexican chorizo and potato pies with tomatillo salsa, and flaky Brazilian shrimp and tomato empanadas to Costa Rican empanaditas stuffed with gooey pineapple jam. With an introduction on the history of empanadas, a lesson on dough types and folding techniques, 60 succulent recipes, and mouthwatering color photographs throughout, Empanadas is a beautiful, practical, and definitive guide to making, serving, and enjoying everyone’s favorite hand-held pie.